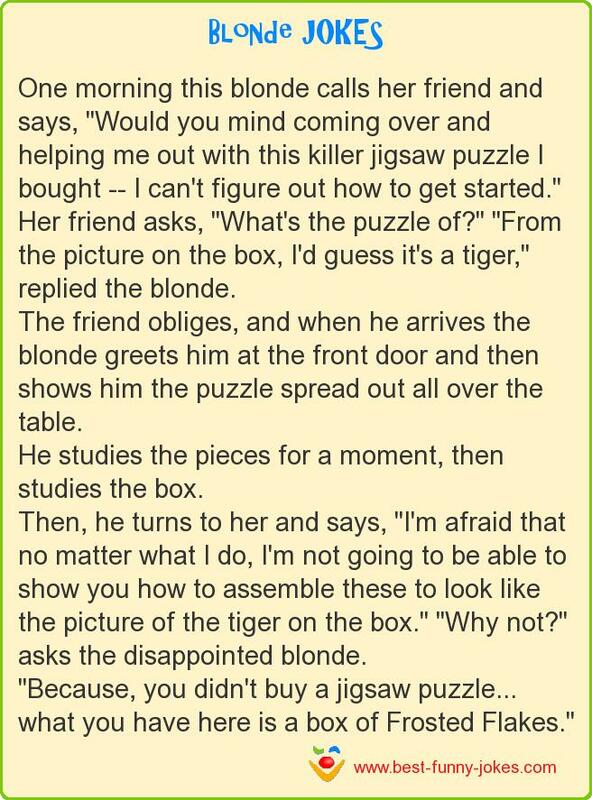 One morning this blonde calls her friend and says, "Would you mind coming over and helping me out with this killer jigsaw puzzle I bought -- I can't figure out how to get started." Her friend asks, "What's the puzzle of?" "From the picture on the box, I'd guess it's a tiger," replied the blonde. Then, he turns to her and says, "I'm afraid that no matter what I do, I'm not going to be able to show you how to assemble these to look like the picture of the tiger on the box." "Why not?" asks the disappointed blonde. what you have here is a box of Frosted Flakes."